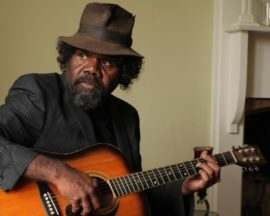 One of Australia’s most in-demand Indigenous artists, Frank Yamma sings in English and his native Pitjantjatjara. He effortlessly crosses cultural and linguistic boundaries and carries the audience with him. With his mighty songs, magical guitar playing, and deeply evocative voice, his performances are filled with soulful, heartfelt emotion. The Adelaide-based artist has toured extensively worldwide and earned a coveted spot at the prestigious WOMEX world music conference and trade show in 2014. His 2010 recording, Countryman, was critically acclaimed and gained international attention. His most recent recording, Uncle (2014), features songs of country, travel, heartache, and love, and reveals Frank hitting his peak with grace and conviction. We warmly welcome this well-travelled artist to Folk Harbour for the first time. Sponsored by Stan’s Dad and Lad.